For many of our alumni, the summer they spent at PGSS was life-changing because of the education they gained and the friendships they formed. For others, lifelong partnerships and commitments grew out of their friendships. The PGSS Alumni Association would like to congratulate all of the couples below, and celebrate with them. Matt Kapelewski and Rebecca Triano met on the very first day of PGSS in June 2007. Matt was attending the program partly because his parents made him apply, and Rebecca was excited but nervous about being away from home for the summer. Matt had friended Rebecca on Facebook prior to the program (bold move!) but this was the first time actually meeting. They went on a walk around campus, became friends, and started dating shortly before the summer ended. Luckily, they lived only an hour apart so were able to see each other quite often. Despite attending different high schools and colleges, Matt and Rebecca stayed together and decided to attend grad school together to study chemistry at UC Berkeley. They managed to both make it through grad school, and after nine years together, Matt finally proposed to Rebecca in April 2016. They'll be getting married in June 2018. Rupali Kotwal Doshi (PGSS 1995) and Saumil Doshi (1994) are married. They both attended Brown University and are physicians currently. Jennifer Lynch and Vikas Vermuri, both class of 2004, are pictured to the right on their wedding day with many of their PGSS classmates. Chris Mohl and Jackee Nowicke, both class of 2003, were married in April 2012. They are both Engineers living in Philadelphia. Yiying Xu and Shiying Cao met at PGSS 2004. 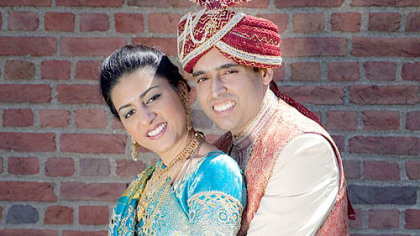 Anita Vin and Kishan Parikh were members of the PGSS class of 2001, and were married in 2009. Also from the class of 2001, Benjamin Slavin and Margaret Smitka Slavin are married. Margaret was a TA in 2004 and 2005, and was a Residence Life Director in 2006. Beverly Jogan and Keith Mathers attended PGSS in 1997, and were both TAs in 2002 and 2003. Having been married in 2007, they now live in Philadelphia. Beverly is a Veterinarian, and Keith is an Ophthalmologist. They have welcomed two baby boys into their family. Tammy Stolz, class of 1997 and Matt Solitro, class of 1992, were both also PGSS TAs. They are now married, working as physicians, and are pictured on the right with their two handsome boys! Kelly Perry and Matt Leerberg were in the PGSS class of 1995. They were both TAs in 1998 and 1999, and were married in 2000. They are pictured on the left with their children Gabriel, Mirella, and Quincy. Heather Rowell Michalak and Phillip Michalak, of the class of 1993, were married in 2002. Dan Yocum and Karen Cross, pictured to the right, met during the summer of 1989 at PGSS!